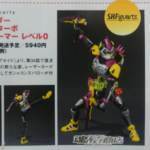 SH Figuarts Kamen Rider Lazer LVL3 Release Details Announced! 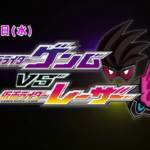 The next SH Figuart release from fan-favorite series Kamen Rider Ex-Aid has been revealed! This time, the Bike Gamer Kamen Rider Lazer gets a proper release using his original combat form- LVL 3, thanks to the power of GiriGiri Chanbara Gashat! Lazer is armed with Chanbara’s signature weapon, the Gashacon Sparrow. Lazer LVL3 is a Premium Bandai exclusive, currently scheduled for release in July 2019! The price is a very modest 6480 Yen before shipping and fees. 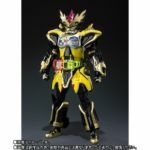 You’ve seen our previous galleries of the Drago Knight Hunter Z derived Level 5 forms for Kamen Riders Ex-Aid, Brave & Snipe. But now it’s time for Kiriya Kujou to shift into 5th Gear with his own form based on this Gashat! S.H. Figuarts Kamen Rider Lazer Hunter Bike Gamer Level 5! Lazer Level 5 is an interesting release because frankly it’s one that many fans have settled for. At the time of it’s announcement, it was the only one of Lazer’s three humanoid rider forms to have been solicited for release. And while it shares elements with his more heavily favored Level 3 form, it’s just not the one that many collectors wanted. Now we know that Lazer Turbo Level 0 is on the way as well, Level 3 seems even more likely to happen in the future. So does this figure merit a spot in your collection? At least ti go with the rest of a 4-player co-op display? Check out our full review to decide for yourself. We’ve attached the full 70 image gallery to this post, but you can also read the entire review by clicking “Discuss on the TokuNation Forums” at the bottom of this post. We’ll be back next time with a double sized gallery featuring two releases separated by nearly 4 years. It’s been too long since we’ve revisited the Showa Era! 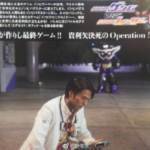 Speculated for some time by fans of Kamen Rider Ex-Aid, we’ve finally gotten confirmation of another figuart for Kiriya Kujou AKA Kamen Rider Lazer! S.H. Figuarts Kamen Rider Lazer Turbo Bike Gamer Level 0 was just revealed via new magazine scans currently making the rounds, we saw them courtesy of Tag Hobby. 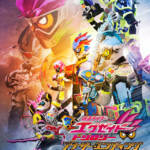 Lazer Turbo as you may recall is Kiriya’s late in the game form from the series, re-using the Ex-Aid style body and armor with the Level 5 Lazer head. It was probably a no-brainer we’d eventually get this release given the recent Level 5 one but it’s good to finally have confirmation. Lazer Turbo will be released as a Tamashii Web Exclusive in May 2018 for 5940 yen. Be sure when order pages go up in the future to contact your preferred middleman or web service about securing an order. Kiriya Kujou. Liar, coroner, Bugster, Kamen Rider. Has there been a secondary character that’s grown more memorable and beloved by fans of a rider show more quickly than him? Almost from the moment he stepped on screen, people fell in love with this two-faced hero. While Lazer has an unconventional Level 2 Rider form, it has a charm all it’s own. After patiently waiting since his appearance early on in the series we can finally share a full review & gallery of S.H. Figuarts Kamen Rider Lazer Bike Gamer Level 2! Lazer Level 2 is an unconventional form for a rider, and a unique Rider Machine, but one that’s been perfectly executed. Capturing Kiriya’s iconic Level 2 form, this figure has been given an exquisite paint job to sell all the right details. But perhaps the best thing about this release is the two Gamer Drivers that are included! One, a standard Gamer Driver with removable Bakusou Bike Gashat, and the other is a “stunt” driver. Based on the type of stunt prop used for action scenes this slimmed down Driver provides some extra clearance for any rider ally. Did I mention that Ex-Aid looks absolutely excellent on Lazer as well? We’ve attached the full gallery of 60 images to this post, but you check out our full review as well by clicking “Discuss on the TokuNation” Forums at the bottom of this post! We have more Kamen Rider Ex-Aid galleries on the way, but next time we’ll be back with another glimpse into Kamen Rider Kabuto!